In September 1998, after the official internment of the Imperial Family had taken place in St. Petersburg, I was invited by Alexander Avdonin to participate in the first search for the Romanov children’s remains. We arrived at the Four Brothers Mine site, off the Old Koptyaki Road, where I found that approximately an area of 200 meters square was divided and marked by numbered stakes every 2 meters. Electromagnetic and Seismic profiling studies were being conducted to find anomaly spots. A team of scientists, archeology students and volunteers had come to this historically significant location to participate in this important endeavor. Nothing had changed since 1918; the roads in the woods remained unpaved, no different to how they would have been decades before.. Each day, after traveling in a car for 30 minutes, we were forced to walk along those same desolate muddy roads to reach the Four Brothers site. The work was planned and organized by Alexander Avdonin. Dr. Avdonin's team consisted of geologists, archeologists, a botanist, a forensic criminal investigator, physicists, a forensic Medical Examiner from Moscow, archeology students from the local Ekaterinburg University, and myself, a sea captain. Our results of the electromagnetic searches as well as the seismic profiling yielded anomalies that indicated areas of disturbance. We investigated these anomalies by digging down to see if the soil at different depths had been disturbed. Dr. Sergey Nikitin compared photographs of the Four Brothers mine site copied from the Russian archive collection. In one of the photographs of the Open Mine at Four Brothers, Sergey noticed a pile of gravel that had been excavated from the bottom of the mine shaft. We found a mound to the left of the cross, when facing it. Comparing the angles and distances to the center of the mineshaft we saw that this was the same pile that Sokolov had originally excavated in 1919. Sokolov, it seems, never had the opportunity to sift through this gravel pile because he had to quickly retreat from the Reds with the White Army. 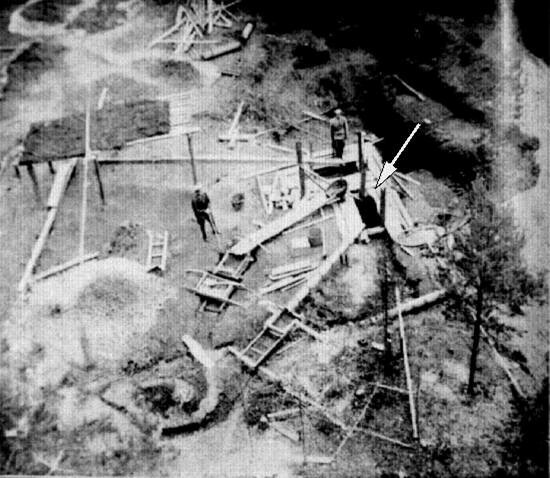 We found one of the bon fires that White Russian General Deterikhs mentioned in his book, and, with the assistance of the local team of archeologists and their students who assisted us, we were able to locate where Sokolov had worked. After digging down 10 centimeters we were back in 1918. Dr. Avdonin chose to start the search around the Open Mine shaft and work radiating outwards. From Sokolov's report and photographs and including the depositions submitted by a number of the killers, that were deposited in the Russian archives, we learned they had tried to burn four of the bodies, and whatever bones were left , where buried under the bon fires. Our first task therefore, was to locate these bonfires. From General Deterikhs' old map we learned that Sokolov had found two such bonfires at the Four Brothers mine area. Unfortunately, General Diterichs’ map was somewhat imprecise, and so by taking the bearings and distance from the center of the shaft, we were able to approximate the location of the closest bonfire to the center of the shaft. We could see the fire's location by the burn stain on the clay ground. From its size of approximately one square meter, we felt that this fire was used either for general cooking or to just simply drive away the abundant mosquitoes. By digging further, we noticed that someone had obviously swept the coals from this fire into the mineshaft. Coal, primarily a carbon substance does not degrade environmentally with time. What this told us was that whatever had remained in the fire had been swept into the mineshaft.We dug under the fire, but found no signs that anyone had dug below the fire. The pile of gravel to the left of the cross had to be sifted thoroughly. I was given a small stool, a small garden shovel and a small perforated metal sifting dish. I chose a corner of this pile and dug in. After a short period of time I noticed something cylindrical in my sieve and realized that it was a bullet. I became very excited by my find. 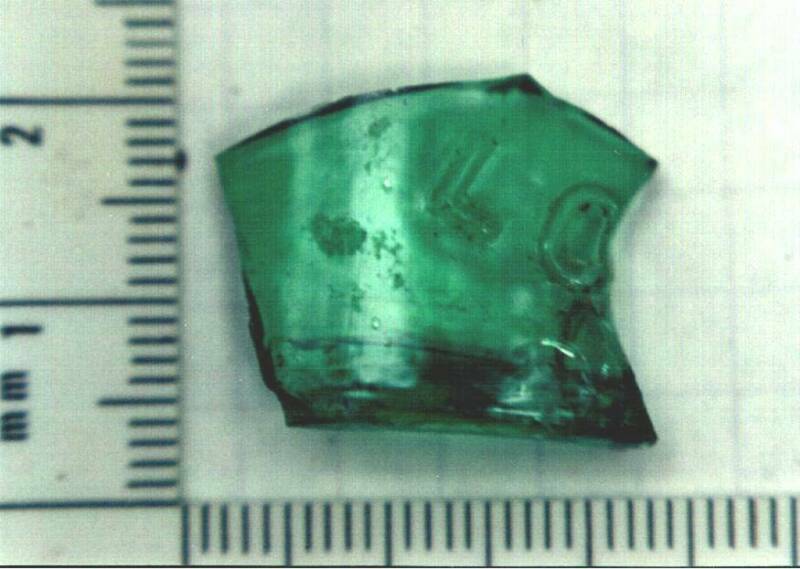 The object turned out to be a .762mm bullet from a Nagan pistol. The next day I dug and sifted without results. However, on the third day of our dig I moved my stool to a more comfortable location around the gravel pile and pulled grass and dirt from the pile to uncover the gravel. After a short while, I noticed a round object in the gravel pile. I took it, carefully, cleaned it, and saw that it was a clear multi-faceted stone that had a hole in the middle. This stone turned out to be a rare white topaz stone that had originally come from a necklace belonging to one of the Grand Duchesses. Investigator Sokolov found 14 such stones, and I managed to find the 15th stone. 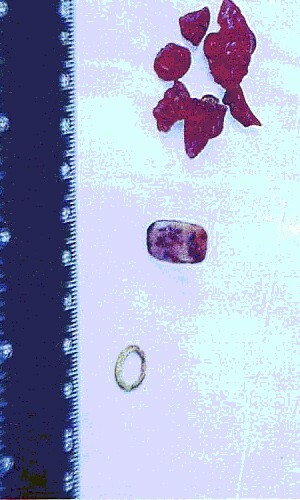 A total of 18 Topaz stones were found, including the ones that Investigator Sokolov found. 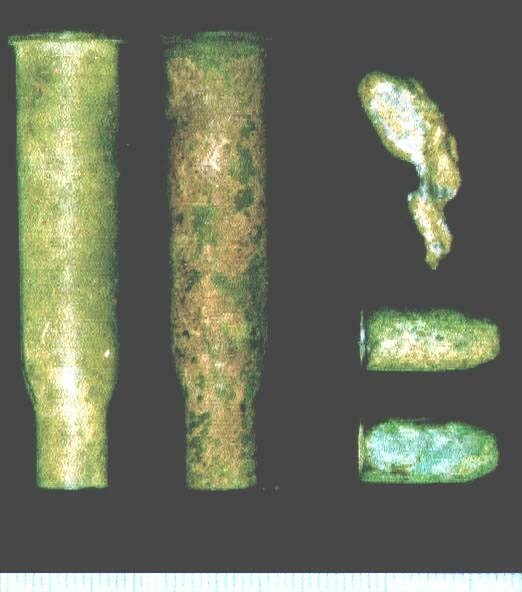 We found articles of clothing that had been swept into the Open Mine shaft by the killers. After the corpses were brought to Four Brothers, the killers ripped off their clothes. It was evident to us that this task was done quickly and roughly, because the blouse pin (top left) was still attached to its other half when we found it. All the clothes were burned and anything that could not be burned was destroyed. It was more than obvious that the the killers were very efficient in their gruesome task. Investigator Sokolov found Anastasia's dog in the bottom of the Mine Shaft submerged under water, lying under a false wooden floor. We checked various other leads in the Koptiaki forest that could have been possible spots for the killers to throw out the charred bones. None of these spots appeared realistic to us or showed signs of previous digging. We found the spot where the killers had dug a large hole by the road in order to bury the burnt remains. However it appeared that nothing had actually been buried there. Importantly, the killers’ reports stating that they had dug a hole by the Koptiaki Road at Four Brothers were confirmed by our investigation. By now the weather started getting worse. It rained and then snowed. To ensure its preservation, Dr. Avdonin decided that it was preferable to move the gravel pile left for us by Investigator Sokolov, to a safer location in Ekaterinburg. We therefore carefully bagged the gravel pile and transferred it to the city. There were many bags of gravel and these were sifted stone by stone throughout the long winter months. I returned to New York excited and proud that I was able to help continue the work of Investigator Nicholas Sokolov. Plans were already made to continue the search in the summer of 1999.